Color coding folders: You can change the color of your folder icons. Right click the folder title and choose Change color. Doctopus now has a "Individual - Differentiated" option which allows individual assignments to be distributed by student "level." Set-up a simple class roster in a google spreadsheet that includes student name and google email. NOTE: Each time you want to run the doctopus script, create a copy of the spreadsheet. Advice from a former 1:1 Student. Access Google Drive even when you're not connected to the Internet. Internet outages and long plane rides shouldn't prevent you from working in Google Drive. Set up offline access so that the next time you're offline you'll still be able to view Google documents, spreadsheets, presentations, and drawings, shuffle folders around, and edit files stored in your Google Drive folder. Follow these steps to enable offline access on your computer. Keep in mind that offline access is available only when you’re using Chrome or a Chrome OS device. If you use Chrome OS, there's no need to complete these steps, as offline access is already set up for you. Setting up offline access is a two-step process. First, click the blue button that saysGet the app. If you already have the app installed, you won't need to complete this step. You'll be taken to the Chrome web store. Click Add to Chrome in the upper-right corner of the browser window. Once the app is installed, you'll be taken to a Chrome page with the Google Drive app icon. To return to Drive, click the Google Drive icon. Only one Google account per Chrome profile can set up offline access to Drive. If you are unable to set up offline access because another user has already done so, you can create a new Chrome profile and then follow the above steps to add offline access for your account. Learn how to create a new Google Chrome profile. If you're using Chrome OS and you're unable to set up offline access because another user has already done so, sign in as another Chrome OS user. You can view Google documents, spreadsheets, presentations, and drawings without an Internet connection. You can also edit Google documents, presentations, and drawings while offline. View access isn't available for Google forms. Learn more about using Google Docs, Sheets, Slides, and Drawings offline. You can also view files such as PDFs, Microsoft Office files, and images, from your Google Drive folder even when you're disconnected from the Internet. Any changes you've made to synced files while offline will sync to all devices with a time stamp when you reconnect to the Internet. If you no longer want to access your Drive offline, click the gear icon in the upper-right corner of your browser window and select Stop using Docs offline. Protect your Google Drive by enabling offline access only on personal computers or computers where you have a password protected account. Enabling offline access on public or shared computers can put your data at risk, since others may be able to view your synced Google documents, spreadsheets, and presentations. Google Docs, Sheets, and Slides have a revision history pane that allows you to view at a glance all changes made to a document by each collaborator. While it may not work exactly like a track changes tool, the revision history tool lets you view and revert to earlier versions of your document, spreadsheet, presentation, or drawing and see which collaborators made edits to any of these versions. Click a time stamp in the right pane to see a previous version of the document, edited by the collaborators listed below the time stamp. Any changes made by a particular collaborator will be shown in the body of the document in the color assigned to that individual in the revision history pane. For example, James, whose edits appear in orange text, deleted and added text while bmichael, whose appear in green text, removed a paragraph and added a comment. For all Google Docs, Sheets, and Slides, revisions are grouped into short time periods to make it easier for the user to identify the slight differences between previous document versions. If you want to see more fine-grained revisions, click the Show more detailed revisions button in the lower right of your document. Google Sheets sometimes trims down your revisions over time to save storage. If you're working in Google Docs, Sheets, or Slides, and your document is either large or you created it a long time ago, your revisions may be pruned. Visit the Revision Pruning help article to learn more about this process. What kind of printers can I print to using Google Cloud Print? How do I connect my printer to Google Cloud Print? Where can I print from? How do I share my printer? How do I rename my printers? What happens if my printer is offline? What happens if my user account is logged out on my Windows, Mac, or Linux computer? How many printers can I register? How can I reconnect a printer that I deleted? Who can see what I’m printing? How can I deploy Google Cloud Print at my company? How do I use the public printer features? How do I print to my Google Cloud Print printer? How do I print from Google Chrome? How do I print to my Android/iOS tablet or phone? How do I print from mobile Google Apps? How do I save files to Google Docs? How do I print a file stored on my computer? How do I print a file at FedEx Office? How do I use the Google Cloud Print app for Android? What is Google Cloud Printer? Why are the printer options disabled when I use the Google Cloud Printer? Why is my document not printing? Why can’t I print to my cloud printer from Chrome? Why are my documents stuck in the print queue? Why is the Google Cloud Print window blank or black? Why doesn't Google Cloud Print work on my corporate network? Why do I see a "Could not get printer information from HP" error? Why don't I see any printers on the Google Cloud Print management page? What does the print job status "Update required" mean? How can I develop a Google cloud ready printer? How can I develop an application that integrates with Google Cloud Print? Is there any example code? What information is shared with Google when I use Google Cloud Print? Can you explain more about these three categories of information? Do you keep copies of all the documents I send to print? Does Google keep a record of what documents I have printed using Google Cloud Print? Can I delete records from my history of using Cloud Print? Does Google look at the contents of documents I send to print? Are they kept confidential? Where can I learn more about how Google treats my personal information? Google Cloud Print is a new technology that connects your printers to the web. Using Google Cloud Print, you can make your home and work printers available to you and anyone you choose, from the applications you use every day. Google Cloud Print works on your phone, tablet, Chrome device, PC, and any other web-connected device you want to print from. Google Cloud Print can print to Cloud Ready printers, which connect directly to the web and don’t require a PC to setup. Google Cloud Print can also connect to existing (classic) printers that are plugged into a Windows, Mac, or Linux computer with Internet access, using the Google Cloud Print connector in Google Chrome. To connect a Cloud Ready printer to Google Cloud Print, follow the instructions for connecting Cloud Ready printers. To connect your classic printer, you will need to install Google Chrome on a Mac, Windows, or Linux computer that is connected to your printer. Once installed, enable the Google Cloud Print connector in Google Chrome. To connect classic printers in a business or school environment, use the Cloud Print Connector service on Windows or Linux. We’re working to provide Google Cloud Print integration with many Google products and services, the first of which are Chrome OS, Chrome, Gmail for mobile, and Google Docs for mobile. You can also print to 3rd-party native mobile apps on the Android and iOS platforms. See applications that allow you to print to Google Cloud Print. You can also try the Google Cloud Print app for Android, so you can not only submit print jobs to connected cloud-ready printers, but also control printer options and manage print jobs right from your mobile device. Visit the Google Cloud Print management page. Click the Printers on the left side. Select the printer that you want to share. When you share printers, you'll share printer names so choose a descriptive name when setting up your printer for the first time. In the dialog that appears, enter the email address for the person or Google Group you want to share with. Your friend will receive an email notification. To disable sharing, follow the steps above to open the Sharing dialog for the printer and edit the user list. Want to share your printer with a group of friends? First, you'll need to set up a Google Group. Once you've set up the group and invited all your friends, follow the instructions above to share the printer. If you've shared a printer with a group and you're the group owner, you're all done -- group members can now access the printer as long as they have a Google Account. If you're not the group owner, a request will appear for the group owner the next time they go to their Google Cloud Print management page. Once they approve the request, group members can access the printer. If you don't see a printer, try these tips below. Check with the printer owner or group owner. Remember, the owner controls printer permissions. If you're sharing multiple printers with the same group, the group owner can wait until all sharing requests have been made and accept all requests at once to avoid accepting each request individually. Visit the Google Cloud Print management page and click Printers. Choose the printer you want to rename and click Rename. Edit the name of your printer and click on Rename. If your printer can’t be reached at the time you submit your print job (e.g. the computer running the Google Cloud Print connector is turned off, or your Cloud Ready printer is disconnected), your job will wait in the print queue in the cloud. Your printer will download and print the job normally as soon as it comes back online. For your classic printer to be connected to the Google cloud, you must be logged into the user account you used to enable the Google Cloud Print connector on your Windows, Mac, or Linux computer. Your print requests will be saved and fetched normally when you log back in. You can connect any number of printers that you like to Google Cloud Print. If you delete your printer by mistake or change your mind later, you can re-connect the printer (including printers on your local device) by following the instructions below. For a classic printer: Sign back into Google Cloud Print from Chrome. For a Cloud Ready printer: See instructions for connecting a Cloud Ready printer. Google Cloud Print jobs are submitted and retrieved over a secure connection (https), and are available only to you and to the printer you submitted the job to. There are a few different approaches to deployment in a corporate or educational environment. To explore available options and tools, see the Business Overview for Google Cloud Print. From the Google Cloud Print management page, select the printer you'd like to share. Remember, users will be able to see the name of your printer when they access it. In the window that opens, click the Change link. From here, select the radio button marked Anyone with the link has access to the printer. The above procedure will allow you to share a link giving people access to the printer. All they need is the link listed in the "Link to share" box. The link to share the printer can be long, so you may want to use a URL shortener like goo.gl. If you select a printer and click the Share button, you can also set the maximum number of pages per day that users can print, called the public printing quota. This is set to 15 pages per day by default, but can be adjusted to another amount or unlimited (no printing restrictions). The steps you take to print will vary from application to application. Find applications that allow you to print to Google Cloud Print. Click the Chrome menu from your browser's toolbar and select Print to print the webpage you are viewing (you can also use the keyboard shortcut Ctrl+P). In the "Destination" section, click Change and choose your printer from the Google Cloud Print section. To learn about printing on your Chrome device, visit the Chrome Device Help Center. If you administer Chrome devices for your organization, learn more aboutconfiguring printers in the Chrome devices for Business and Education Help Center. To send a print job from your computer to your tablet or phone, install Chrome for Mobile on your Android/iOS device and sign in with your Google Account. You'll see your mobile device listed as a printer in your Google Cloud Print dialogue. Just select your mobile device and your print job will be sent over. You can also share your mobile device with other users just like you would share a printer. On mobile Google Apps (like Gmail and Docs), click the menu in the top right corner and select Print. For printing with Google Docs, visit the Google Docs Help Center. For more information, visit the Google Mobile Help Center. Want to save a copy but don't want to print it out? You can easily save documents, like flight itineraries or purchase confirmations, as a PDF file in Google Docs. To save documents as PDF files, open your list of printers and select Save to Google Docs. If you don't see this printer listed, search for [ Docs ] or [ PDF ] to find the printer. Once you've selected the printer, your document will be instantly converted to a PDF and saved in your Google Docs account where you can view or download a copy at any time. Visit the Google Cloud Print management page and click the Print button. Choose Upload file to print. Click on Select a file from my computer. Select the file you want to print and click on the Open button. Choose your printer and click the Print button. From your Chrome device: Press Ctrl+P >choose Search for additional printers > select Print to FedEx Office. From Chrome: Ctrl+P, choose Google Cloud Print from the destination, selectPrint, and then select Print to FedEx Office. A notification box appears with a FedEx Office code that is available for use immediately and valid for up to 10 days. Use this code to pick up your document from any FedEx Office location. When you pick up your document at FedEx Office, you'll have the chance to customize your document in a number of ways. Some examples are printing larger sizes, double sided printing, printing select pages, and printing in color or black and white. Didn’t write down your FedEx Office code? Google Cloud Print will send you an email with your code. You can also get your code by opening up the Google Cloud Print management page, selecting your print jobs, and clicking Details. Your code will appear in the right hand panel. The available Google Cloud Print app for Android makes it easy to manage your print jobs, even across multiple accounts. You'll be able to print documents to any cloud-ready printers you've added to your Google account, but you'll also be able to control printer options and review previously-submitted print jobs right from your mobile device. Install and open the app: Once you've installed the app, simply open it by touching the Google Cloud Print icon. Manage print jobs: When the app opens, you'll be shown a list of submitted print jobs. To delete a queued or printed job, touch and hold the job to select it. When you're in this selection mode, you can select multiple jobs to delete. Switch accounts: You'll see the print jobs for the account that is indicated at the top of the screen. To view print jobs or printers for a different Google account, just touch the header to switch between them. Submit a new print job: There are a couple of ways you can use the Google Cloud Print app to print. First, you can use the "Share" or "Send" button from a different app (like Chrome for Android) and selecting Cloud Print. Alternatively, you can print directly from the app by touching the Print icon at the top of the screen that looks like a printer. Once you've selected the file you'd like to print, you can select the printer you'd like to send your print job to. Manage printer options: After you've selected your printer, you'll be able to adjust settings like printing in color or black-and-white, paper size, and DPI using the pull-down options. About notifications: Once you've submitted the print job, you'll get a confirmation in the form of a notification. Touching the notification will take you back to the Cloud Print app to view the current job status. Google Cloud Printer allows you to use Google Cloud Print from applications on Windows like Adobe Reader in the same way you use local printers. After it's installed, print from any application the same way you usually would, then selectGoogle Cloud Printer as your printer. A new dialog will appear to select which printer in your Google account to use, and your printing options. Learn more or install the Google Cloud Printer here. The Google Cloud Printer doesn't accept options from the Windows print dialog, because they may not be compatible with the cloud printer you select. Instead, you can select print options in the Cloud Print dialog that appears after selecting which cloud printer to use. Make sure your Google Cloud Print connector is running on a computer with Mac, Windows, or Linux. If you're using Windows XP, make sure you also have the Windows XP Service Pack 3 (SP3) installed. Confirm that the computer connected to your printer is powered on and that you are logged in. To print directly from your Chrome browser, make sure you're running the latest version of Google Chrome. If your documents are stuck in the print queue, try these tips below to solve this issue. Make sure your Google Cloud Print connector is running on a computer that is turned on and using the latest version of Google Chrome. Make sure your printer is on and connected to the computer running the Google Cloud Print connector. Make sure you're printing to the correct printer. Sometimes, there may be duplicate printers shown. In Google Chrome, select Settings and click the Show advanced settings link. In the "Google Cloud Print" section, click Sign out of Google Cloud Print. Visit the Google Cloud Print management page and click on Printers. Delete any duplicate printers (printers with the exact same name) and then sign in to Google Cloud Print again. Make sure your printer is on. Make sure you've set up Google Cloud Print on your printer and try printing again. If you have an extension installed, such as Ask Toolbar, it may cause issues with Google Cloud Print. Try disabling your extensions one by one to see if a particular extension is causing the problem. To disable an extension, click the Chrome menu on the browser toolbar > Tools > Extensions. Once you've disabled an extension, try printing your document again. If you're using a restricted or corporate network, Google Cloud Print may not work properly. For example, your documents may get stuck in the print queue and won't print until you restart the computer that has the connector enabled. If you're an IT administrator and interested in setting up Google Cloud Print for your corporation, contact the Google Cloud Print developers group. If you see a "'Could not get printer information from HP" error, you've probably already registered your HP ePrint printer with another account. To resolve this issue, you can follow any one of the steps below. Unregister the printer with the original account and register it with a new account. Share the printer from the original account to your new account. Request a new email address from HP and re-register your printer. If you don't see any printers listed on the Google Cloud Print management page, try these troubleshooting tips below. Make sure you're signed in to the same account on your Google Cloud Print management page and the Google Cloud Print connector in Google Chrome. Make sure you have local printers available. In other words, your printers should be installed on the computer with the Google Cloud Print connector. Verify you're on the latest OS version on your Chrome device, Mac, or Windows machine. Sign out and sign back in to the Google Cloud Print connector. Verify the computer with the Google Cloud Print connector is on and running. Make sure that your printer driver is up-to-date. If your printer driver is outdated, install the latest version from your manufacturer's website. Some Epson Cloud Ready printers may experience problems due to a recent change to Google Cloud Print. If your printer is affected, your print jobs will display the status "Update required" in the Cloud Print Management page. To resolve this issue, follow these instructions to update your printer to the latest firmware and re-enable Google Cloud Print. For a step-by-step guide to developing printers that integrate with Google Cloud Print, check out the tutorial available on our codesite. If you are an application developer looking to enable Google Cloud Print in your web, mobile, or native app, check out the tutorial available on our codesite. The Google Cloud Print connector in Chrome is open-source and available for review. Sorry, we're unable to offer support to teams looking to build or compile Chromium or Chromium OS beyond what is publicly available in the developer forums. Sample code relevant to both application developers and printer makers is also available on our codesite. There are three categories of information shared with Google when you use Google Cloud Print - information about the jobs you send for printing, the documents themselves, and server logs created from each request you make to the Google Cloud Print service. Of course. Google keeps information about the print job in question (the job title, the printer you sent it to, printer status information) as a record, along with your Google Account ID. We need this information in order to process the jobs you send for printing, and to allow you (and only you) to view and edit your printing history through the Google Cloud Print dashboard. Google also keeps a copy of each document you send for printing - but only for so long as the printing job is active and not complete. We have to do this to make sure your document gets printed. Once the job is complete, the document is deleted from our servers. Finally, our servers also keep logs of the requests made by all of the Google Cloud Print users. These are routine server logs and do not contain any personal information. You can read more about how Google treats server log data. Yes, but only for so long as the printing job is active and not complete. We have to do this to make sure your document gets printed. Once the job is complete, the document is deleted from our servers. Yes. Google keeps information about the print job in question (the job title, the printer you sent it to, printer status information) as a record, along with your Google Account ID. We need this information in order to process the jobs you send for printing, and to allow you to view and edit your printing history through the Google Cloud Print dashboard. Absolutely. You can see and edit these records through the Google Cloud Print dashboard at any time. Documents you send to print are your personal information and are kept strictly confidential. Google does not access the documents you print for any purpose other than to improve printing. Google Drive allows you to upload and store files in the cloud. You can manually upload both files and folders, including images and videos. Customize your manual upload settings. You can drag-and-drop your files directly from your computer into your Google Drive. In your Google Drive, click the Upload button and select Files... from the drop-down menu. Your file will appear in My Drive. Uploading a folder can save you the time and hassle of uploading individual files from your computer to Google Drive. When you upload a folder, you'll also save the time it takes you to organize your files and documents into folders. You can upload one or more folders to Google Drive at a time. Individual files within that folder will be uploaded, and subfolder structure will be maintained. If you see Enable folder upload and you're in Chrome, then you will need toupdate Chrome to the latest version. When you're done with your upload you can click the link to open the uploaded folder in Google Drive or close the box by clicking the x in the upper right of the box. Who can see the files I upload? The default visibility setting for uploaded files is “Private.” Unless you change those settings or choose to share specific files, only you will be able to see the files you upload. An uploaded file can be up to 10 GB. If you’d like to convert a file to a Google documents, spreadsheets, or presentations format, the size limit depends on the file type. Learn more about the size limits of Google documents, spreadsheets, and presentations. You can share any uploaded file with another person. If you’ve converted that file to a Google documents, spreadsheets, or presentations format, you can also collaborate on that item in real time with other people. With Google Drive, you can share files — like documents, images, and PDFs — without having to email them as attachments. Sharing is as easy as indicating which email addresses or mailing lists should have access to a given file. Check the box next to the file or folder you'd like to share. Choose a visibility option: "Private," "Anyone with the link" or "Public on the web." Choose the access level from the drop-down menu next to each collaborator: "Can view," "Can comment," or "Can edit." Sharing something with a mailing list? If you’re sharing with a group containing more than 200 members, don't skip notifying people by email. Your fellow mailing list members need to directly click the link in the email notification in order for a shared item to show up in their “Shared with me” folder. If you’ve set a file or folder to "Anyone with the link" or "Public," you can send the link to another person and they’ll be able to access it. Click the Share icon . Copy the link at the top of the sharing settings. Open the file you'd like to share. Select a file type from the drop-down menu. Enter the email addresses of the people to whom you'd like to send the file. If you'd like, you can also add a subject and a message. Click Send. Recipients will receive the file as a downloadable attachment in the format you've selected. Whenever you share something with someone, they’ll receive an email notification to let them know they have access and can retrieve what you shared the next time they sign into Google Drive. Prefer not to notify them? Uncheck the "Notify people via email" box. Rather than type your collaborators’ email addresses one-by-one, add an entire Google Group. Each member of that Google Group will have access to whatever you’ve shared, including people who are added to the group after you’ve shared something. This option isn’t available for mailing lists that aren’t Google Groups. If you want to share multiple items with your collaborators, move them into a folder and share the folder, with them. Since you’re sharing the folder, that’s their key to access. They’ll be able to access whatever’s stored there or lose access if you remove something that they don’t already have access to. It may sound obvious, but sometimes the best way to find something is to start looking. Google Drive will let you quickly preview more than 30 file types and quickly flip between files until you find the one you want. Last, click the radio button like you see above. If you don't make this change, other users when given write access to a doc you share, and can share it with their personal gmail account instead of being "locked" into using their CPS account. One downside of that happening is not being able to tell who edited the document since many personal email addresses have nothing to do with their actual name. Advanced Google Form Editing Tips from Northside Prep Tech Dept on Vimeo. In this video we look at editing and moving questions in the form and in the spreadsheet behind the form. 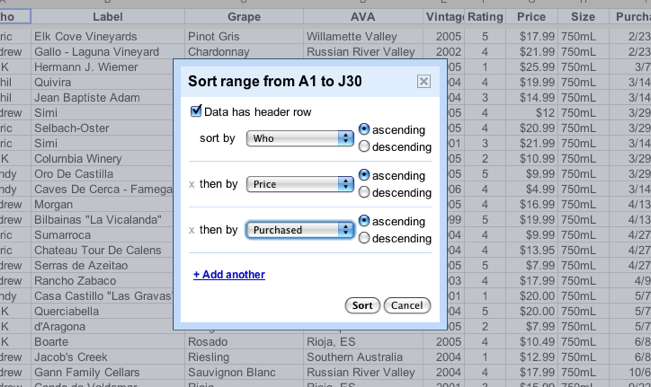 We also look at sorting the data in the spreadsheet. Sharing a Google Form and its Data from Northside Prep Tech Dept on Vimeo. Learn to share a Google Form via email, by direct link or embed the form in a webpage. Share the forms response data in spreadsheet or summary format. Customizing and Editing a Google Form from Northside Prep Tech Dept on Vimeo. In this video we look at Google Form themes, how the user can interact with the form such as editing responses, requiring/recording the respondent's username and customizing the submission confirmation. Creating a Google Form from Northside Prep Tech Dept on Vimeo. Learn to create a Google Form, about different types of questions and editing questions. Uploading to Google Drive from Northside Prep Tech Dept on Vimeo. Interested in how to get your current "stuff" onto your Google Drive? This tutorial will how you how to upload your files with the option of converting them to the Google Docs format. Installing the Google Drive Client from Northside Prep Tech Dept on Vimeo. This tutorial will show you how to install and configure the Google Drive client on your PC. Organizing Google Drive from Northside Prep Tech Dept on Vimeo. This tutorial will show some basic ways of keeping your Google Drive organized. Having a Google Drive repository for your class is a great way to organize documents and files that your students will need to access, but not necessarily turn back in. Doctopus is a Google Script that will allow you to distribute a Google Doc to your students where both you and the individual student have write access. This can be a great way to distribute a worksheet, have the students work on it individually, and then grade when the due date has passed. There are 3 things you will need to use Doctopus. You will need a class roster in Google Spreadsheet, a Google Drive folder where all created Google Docs will be saved, and the Google Doc you would like to distribute. The class roster is a simple Google Spreadsheet with 3 basic columns: Last Name, First Name, and Email. You will also need to create a folder in your drive with an easy to remember name, such as the assignment name. Ready? Open the class roster that you have made in Google Spreadsheets. Click File, Make a copy... This copy will be where you reference all of their completed assignments, assign grades, and write comments. You will want to include the assignment name in the document's name and any other info so you can easily find it later. In this new Google Spreadsheet select Insert, Script... Search Doctopus at the top and select Install and Authorize. Verify the remaining settings for Step 1 and select Save settings. Step 2 you will select the folder where your assignment resides and the actual document that should be distributed. Step 3 you will select the folder where you would like the newly created documents to reside. When choosing how you would like the files named you can use the variables listed on the screen to include your student's name in the title. This is highly recommended so you can easily see whose document is whose without opening the document. Review your settings and click Run Copy and Share if all looks alright. You will now see a few additional columns in your Google Spreadsheet: Link, Last Edited, Grade, and Written Feedback. After the due date is passed you will want to select Embargo for grading under the Doctopus menu. This changes your student's share rights to Read Only so they may no longer make changes to the document. Once you have finished grading and filling in any necessary feedback you can select Email grades and feedback to notify your students that the assignment has been graded. In Google Drive you are able to create a folder for your class where you can keep all documents and files your students need access to. Students can be given read-only access so that they may download the material, but not change or move any files accidentally. You will then be asked for a name of the new folder. We recommend sticking with the following naming convention, Last Name Course Name Period (ie. Yanek Computer Science 3A). There are two ways to add your students to the Google Drive folder. If you have a roster with emails already created you can paste in their email addresses (comma separated), chose Can View, and Share and save. The recommended way would be to take a moment to create a Contact Group in your Google Contacts and then add the group instead of individual email addresses. At the top of the Sharing Settings window, Google provides a web address that you will post on your Google Site or other class page for your students to easily access the folder.